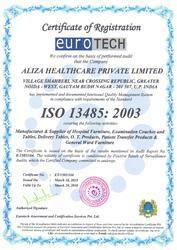 Established in 2013 we, Aliza Healthcare Private Limited an ISO 13485:2003 certified company are well-established organization manufacturing, supplying and exporting an elite range of Hospital Furniture. Our wide range of product includes Hospital Bed, Hospital Trolley and Labour Table. Obtainable products are highly precise and valued by all respected clients owing to optimum finish, rust resistance, lightweight, and finest quality. Offered variety is fabricated under the leadership of experts by engaging quality input and high-end technology in agreement with set worldwide norms and standards. 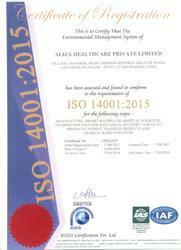 Raw materials used are acquired from licensed and consistent suppliers in the market. 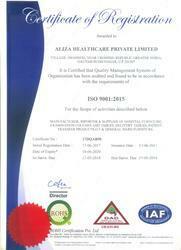 Our whole range of product is provided to doctors for various purposes. All these products are obtainable in market at reasonable prices. We export our products across the globe. We have firm fabrication units that make us to develop these high quality array of products as per the needs and requirements of respected clients. Our experts and experience-holding experts follow the needs and necessities of the patrons and make these products in all possible ways. Moreover, our firm is also engaged in creation of products as per the different want of clients. Quality panel at our unit examines the quality of widespread range of product on numerous levels to make sure that customers get quality collection of products from the marketplace. Under the leadership of Mr. Mushahid Husain, we are highly skillful of offering finest quality array of products to valued clients in rational prices. We are a prominent name in the market for continuously making accessible quality range of products. Before final discharge of final product, we first make these products assume many tough quality checks, which are executed under selected team of personnel who have huge knowledge and info of their field. These personnel have vast information and ability to implement and understand clients demand in a precise manner. We are highly appreciated through the nationwide markets for these finest quality diversities of products. 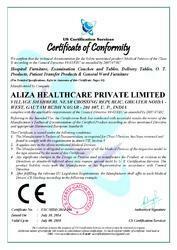 Aliza Healthcare Private Limited is renowned corporate for dealing in market with wide range of products such as hospital furniture. The product promises quality by using best quality raw material of dealers. 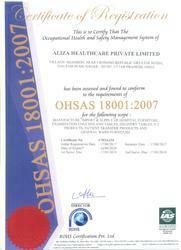 Our products assume numerous quality checks to make sure that product is up to global norms and standards.